As you know, I absolutely love May (especially because there are no bugs yet! ), but June is a blast! We started the month with a great Summer Evening Party my sister hosted last night, and will end the month with the celebration of my husband and I's 3rd anniversary. Its going to be a good start to the summer! How are you bringing in the summer? I love that dress, and the purse, and the tumblers! And the glasses. In other words, I love it all! I'm going downtown this afternoon, and this post is making me need to stop in Anthropologie to try on that dress! We've started off summer with swimming! My six month old had never been in a pool outside, so that was new to him! Took a while for him to get used to it, but then he loved it! I love the color yellow. Becoming one of my favs to wear! Like those sunglasses! That dress is so, so pretty! I really like the tote, too! oh i loooove this! i really would like to buy me something yellow, i love it, although some friends thing it doesn't suit me that much as color…hmmm. and that glasses are just adorable..want to drink from there! Happy Anniversary to you and your husband! I hope you have a great weekend. Those golden tumblers are pretty awesome. How decadent would that feel to drink out of?? Gorgeous dress--I'm forwarding it to my girlies. They don't listen to me, but they will to you. I love that purse, so cute! june is def my fave month because it's my birthday!! have a wonderful weekend, dear! Oh my goodness...love these sunny pretties- those tumblers are just calling my name!! Hope you're having a great weekend!! i am in love with those sun glasses!! and i'm excited for june too! two weekends of craft shows and 2 weekends of cottage!! ooooh, how I love that dress! im such a sucker for summer :) especially the month of june. and congrats to you and your hub on almost 3 years! Anna you've hit home! I'm a sucker for gold :) Love all of these picks..and I'm thinking I need those tumblers! Beautiful golden finds, getting me excited for summer! One of my favorite gold touches is gold eyeshadow. I have one from clinique that is so thick and sparkly! loving the colors! my husband and i are celebrating our 3rd anniversary this month too! oooh I love june too! And what a great way to start summer! Such a sweet and joyful post! I'm not looking forward to the bugs, but I do love all the blooms and sunshine! Congratulations on the 3rd anniversary! 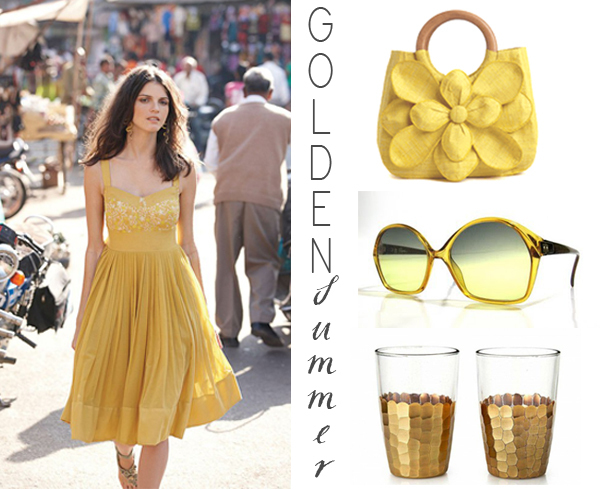 Yellow is such a gorgeous color for summer--I especially love those sunglasses! Sounds like June will be a great month too! YES!! I"m loving yellow so much lately!! that dress is amazing. those tumblers are amazing, definitely would be fun to have for summer! SOOOoo super cute! You always find the cutest stuff I swear! Happy Anni girl!